The European Commission has just approved the final framework of the EU-US Privacy Shield and formal adoption is now underway. The European Commission has released information that the next steps include the notification and immediate implementation by EU Member States, while on the other side of the pond in the U.S., the Privacy Shield will be published in the United States Federal Register and will be enforced by the U.S. Department of Commerce. 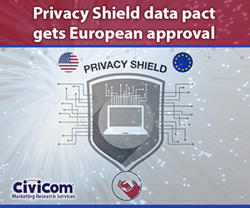 Civicom Marketing Research Services has offered webinars on strategies for effectively handling data in compliance with the EU-U.S. Privacy Shield. The Privacy Shield, a revised framework that was necessitated by the invalidated Safe Harbor Agreement, is a strengthened safeguard of the privacy of European citizens and entities as their data is transferred across the Atlantic. According to the European Commission, the new agreement includes strong obligations on companies and robust enforcement of clear safeguards and transparency obligations on U.S. government access, effective protection of individual rights, and an annual joint review mechanism between the European Commission and the U.S. Department of Commerce. Global solutions provider Civicom Marketing Research Services recently reviewed updates on the new EU-U.S. Privacy Shield as part of its webinar series, recognizing the influence of the framework to businesses operating globally, and particularly the impact on market research firms serving clients internationally. Civicom’s webinar “Overcoming Emerging Roadblocks to Managing Personally Identifiable Information (PII) for Marketing Research Respondents” emphasized necessary practices and best strategies for effectively handling data in compliance with border safeguards such as the EU-U.S. Privacy Shield. Civicom will be speaking on the decisive vote of the UK to leave the EU in the company’s upcoming webinar “How Will Brexit Impact Marketing Research,” weighing in on questions that have arisen since the referendum and focusing on its impact on marketing research. The webinar will be held in several time zones from July 19 to July 22. For more information about the Civicom Brexit webinar, email inquire(at)civi.com. Civicom Marketing Research Services is a global innovator providing qualitative research tools using the latest technology solutions for marketing research. The company works hand in hand with market research firms, facilitating marketing research projects both locally, as well as those with extensive global reach.